Background: Adverse drug events (ADEs) account for considerable patient morbidity and mortality as well as legal, operational and patient care costs. In Veterans Affairs (VA) hospitals in the USA, all serious adverse events and “potential” adverse events are reviewed using root cause analysis (RCA). This study characterised RCA reports associated with ADEs to determine what actions VA RCA teams took to reduce the number or severity of ADEs, and to evaluate which actions were effective in doing so. Methods: Every medication-related RCA submitted to the VA National Center for Patient Safety in the fiscal year 2004 (143 reports), and one medication-related aggregated RCA from each facility (111 reports covering 4834 ADEs) were reviewed and coded. Facilities were interviewed about specifics of their reports and the results of their interventions. Results: The commonest classes of medication for which ADEs were reported were narcotics, chemotherapy, and diabetic and cardiovascular medications. The most common types of ADE were “wrong dose”, “wrong medication”, “failed to give medication”, and “wrong patient”. 993 actions were taken to address these ADEs, the majority (75.7%) of which were reported to be fully implemented. Improvements in equipment and improving clinical care at the bedside were associated with reports of improved outcomes (p = 0.018, and p = 0.017 respectively), and training and education were negatively correlated with reports of improved outcome (p = 0.005). Improving the process of medication order entry through the use of alerts or forcing functions was positively correlated with reports of improved outcomes (p = 0.022). Leadership support and involving staff were associated with higher implementation rates (p = 0.001 and p = 0.010, respectively). Conclusions: Changes at the bedside and improvement in equipment and computers are effective at reducing ADEs. Well-organised tracking and support from leadership and staff were characteristics of facilities successful at improving outcomes. Training without action was associated with worse outcomes. For some adverse events—such as adverse drug events and falls—in which many “potential” and less serious adverse events occur, VA facilities combine data from all events that occurred over a 3–6 month period to produce an “aggregate review” of the data in the category. These aggregate RCA reviews constitute an 11-step process39 in which critical factors of each adverse event (eg, time, location, type of medications, environmental conditions) are analysed together. On the basis of this analysis, common root causes are determined and actions are developed to ameliorate them. The advantage of the aggregate review is that the actions taken to improve care are based on data from multiple events and so are more likely to address problems common to many events. We wanted to review a representative sample of RCA reports that came into the VA National Center for Patient Safety (NCPS) to understand the rates and frequencies of reported adverse drug events, the underlying root causes of these adverse events and the actions that RCA teams developed to deal with the causes. In addition, we were interested in the success factors and barriers to implementing the actions. This report represents the first descriptive study of RCA reports addressing adverse drug events in a national healthcare system. To encourage the development of a culture of safety within the VA healthcare system, a system that provides comprehensive healthcare services to over 6 million veterans across the USA through 154 VA medical centres nested within 21 geographically defined integrated service networks, the VA established the National Center for Patient Safety. To collectively learn about adverse events, the NCPS instituted an RCA programme to analyse adverse events.40 Each VA facility supports a full-time patient safety manager responsible for investigating all adverse events at the local level. Each event is coded both for the actual harm and the potential harm that could have occurred. If an event could have resulted in an adverse event but did not—either by chance or through a timely intervention—the potential harm is coded based on the worst case scenario. Harm and probability are combined to get a score from 1 to 3 called the Safety Assessment Code (SAC)38: a rating of 1 represents the lowest level of priority whereas 3 represents the highest level of priority for undergoing an RCA. All events coded as causing catastrophic harm regardless of the probability of the event happening again, and all events coded as causing major harm and as frequent events are coded as a SAC 3. These are analysed using the RCA process. All “potential SAC 3” events are included in the quarterly aggregated review of adverse medication events or the patient safety manager has the option of conducting a full RCA. It is interesting that 88% of the single case RCA reports on adverse drug events were potential rather than actual SAC 3 events. All RCA reports come into the VA NCPS via a secure computerised report system. Single case RCA reports are submitted to the NCPS throughout the year and aggregated reviews of medication-related events are submitted each quarter. The RCA reports are mostly narrative descriptions of the event, including all contributing factors, a final understanding of the event, and a specific action plan for addressing the causes. Each action plan is specified, with a timeline for implementation and a description of how, when and by what parties the accomplishment of the corrective actions will be evaluated. All RCAs are co-signed by the director of the facility from which the analysis was submitted. We reviewed all aggregate RCAs of adverse drug events for the third quarter of the fiscal year 2004 in which an aggregate report was submitted for every VA facility. To identify single case RCA reports on adverse drug events, we conducted a keyword search of all RCA reports received in the fiscal year 2004 to identify any events in which medications were a major contributing factor. The keywords were used by the authors to find any RCA reports associated with medications or medication errors. For example, an RCA report may have been identified as having to do with a patient fall, but the fall may have been caused by medications that led to increased dizziness. If medications were a major contributing factor, the report was included in our review. Of the 1083 single case RCA reports submitted in fiscal year 2004 we found 143 reports concerning adverse drug events (13.2%). We developed two code books (available on request) to quantify the aggregate and single case reports. For each adverse drug event, the class of medication and location (inpatient or outpatient) was coded, as well as the type of adverse event. In addition, each root cause was coded into a general category (policies and procedures, communication, equipment, medication dispensing, training, staffing outpatient medication issues or other) and then into a more specific category nested within the larger category. The action plans were also coded into superordinate and specific categories. Two coders independently coded 25 aggregate reviews and after review and revisions to the codebook, reached 93% agreement (κ = 0.92). These two coders also independently coded 10 single case RCAs and after review and revisions to the codebook, reached 91% agreement (κ = 0.90). After this level of agreement was reached, the coders independently coded the remaining RCAs, and further coding questions outside of the operational definitions were discussed with at least one research team member and coded by consensus. The single case RCA reports have a greater level of detail than the aggregated RCA reports, because the single care reports describe one adverse event whereas the aggregated reports describe the factors common to many adverse drug events. Consequently, the two sets of reports were coded and analysed separately. After the initial analysis the actions for single case and aggregated RCA reports were combined for the secondary analysis described below. In addition, the patient safety manager was asked about “success factors” and “obstacles” to implementing their action plans, and about the professions represented on the team that conducted their RCAs. Responses to the structured interview were coded. Summary statistics were calculated for the root causes and actions generated for both aggregated and single case RCA reports. For the single case reports, summary statistics were also calculated for the location, class of medication and type of adverse event. Correlational analysis was conducted to determine the relationship between the type of event and the outcome. The actions produced in the aggregated and single case reports were combined for correlational analysis to determine the relationships between the type of action and reports of implementation as well as improved outcomes (Spearman ρ was used for correlational analysis between dichotomous and ordinal data). To track overall performance at the facility level, two variables were generated: the rate of implementation and the rate of improvement. The rate of implementation is the total number of actions fully implemented over the total number of actions generated. The rate of improvement is the total number of actions in which outcome was rated as “better” or “much better” over the total number of actions generated. Correlational analysis was used to determine the relationships between these rates and reports of success factors and barriers to change. Of the 154 facilities in the Veterans Health Administration, 120 submitted at least one RCA report or an aggregated RCA report about adverse drug events during the fiscal year 2004. An aggregated review was submitted by 111 facilities and at least one single case RCA report was submitted by 76 facilities (37 facilities submitted one report, 23 submitted two reports, 8 submitted three reports, 5 submitted four reports, 1 submitted five reports and 2 submitted six reports). Of the 21 geographical regions within VA, the range of RCA reports submitted was 0–18 (mean (SD) 6.71 (4.51) reports). Within the VA, in the third quarter (or next most recent quarter) of the fiscal year 2004, 111 aggregated RCAs analysed a total of 4834 adverse drug events and produced 227 root causes and 336 actions. Approximately 22.9% (n = 52) of the root causes were attributed to problems with policies or procedures, 16.7% (n = 38) were problems with training or education, 13.2% (n = 30) were problems with equipment, 11.9% (n = 27) were bar-coding or medication dispensing issues, and 11.0% (n = 25) were communication issues. 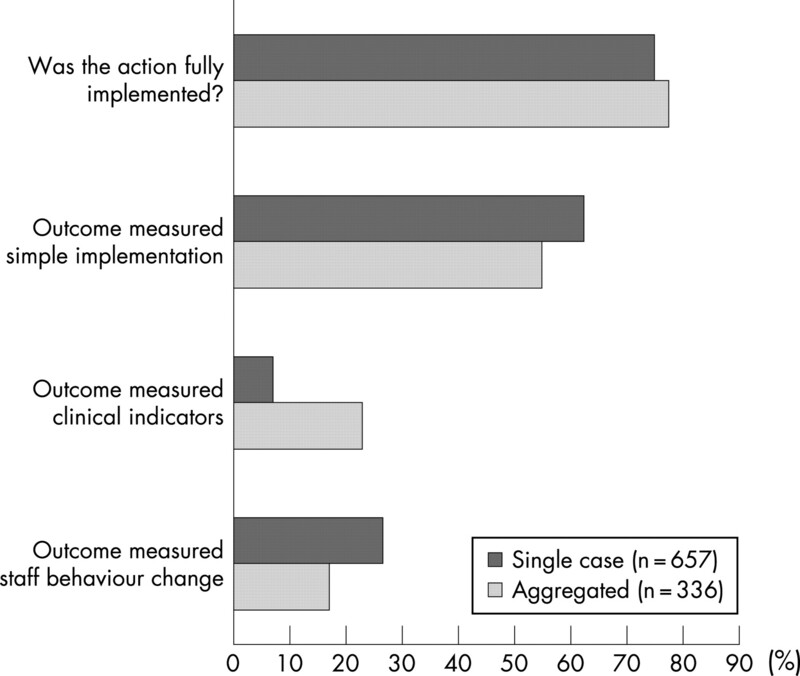 For the aggregated reviews 26.5% (n = 89) of the actions focus on changing policies or procedures, 25.9% (n = 87) on training or education, 14.6% (n = 49) on making clinical changes at the bedside, 11.0% (n = 37) on improving equipment or computers, 10.4% (n = 35) on improving data collection, and 5.6% (n = 19) on communication. Within the VA, in the fiscal year 2004, 143 single case RCAs on adverse drug events were submitted to the NCPS. These RCAs identified a total of 397 root cause/contributing factors (mean (SD) 2.80 (1.60) root causes per RCA), and produced 657 actions (mean 4.59 (2.98) actions per RCA). The median number of person hours to complete each RCA was 35 h (range 6–1590 h). Although these cases were received in the fiscal year 2004 (1 October 2003 to 31 September 2004), the reported date of the events ranged from November 2001 to September 2004. The actual SAC score was 3 in 22.4% (n = 32) of the cases, 2 in 38.5% (n = 55) of cases and 1 in 39.1% (n = 56) of cases. The patient’s age was not reported in 65% (n = 93) of the RCAs, and the gender was not reported in almost 40% (n = 57) of the cases. For those that reported, the ages ranged from 47 to 89 years (mean 67.5 (12.1) years). Almost all patients involved in adverse drug events were men (98%, n = 84). Figure 1 displays the distribution of adverse drug events by medication class and whether the adverse event occurred in an inpatient or outpatient setting. Overall, nearly 38% (n = 54) of the adverse drug events occurred in the outpatient setting; the most common inpatient location was the intensive care unit (10.8%, n = 15). The most common class of medication for which adverse events were reported was narcotics (21%, n = 30), followed by anticoagulants (heparin, warfarin and antiplatelet drugs combined; 14.7%, n = 21), chemotherapy (11.2%, n = 16), diabetes medications (9.1%, n = 13), and cardiovascular medications (7.7%, n = 11). The most common type of adverse events were: wrong dose of correct medication given (31.5%, n = 45), followed by wrong medication given (13.3%, n = 19), failed to give medication to patient (11.9%, n = 17), and medication given to the wrong patient (10.5%, n = 15) (fig 2). 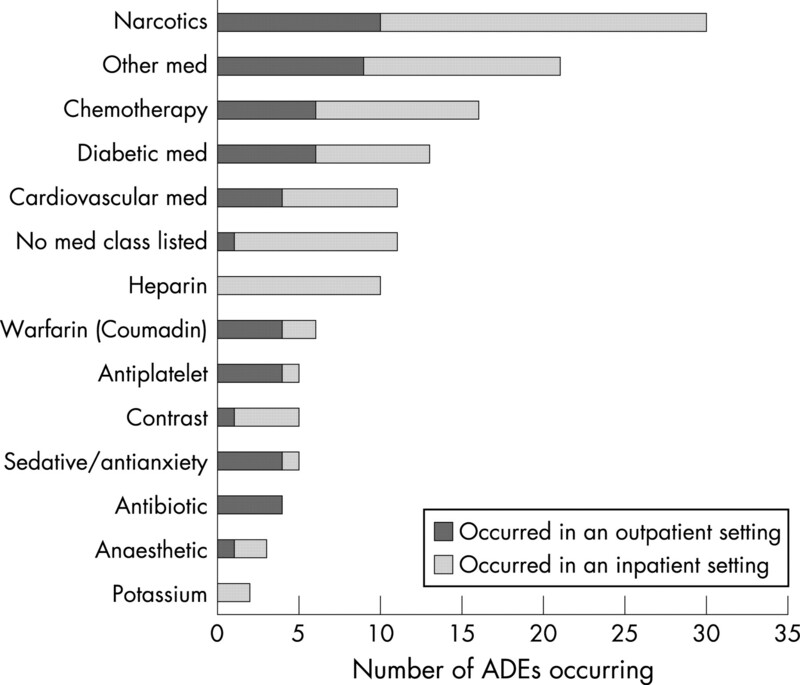 Figure 1 Distribution of the 143 adverse drug events (ADEs) that occurred in the fiscal year 2004 by medication class and location of the event. med, medication(s). Figure 2 Type of adverse event for all (inpatient and outpatient combined) 143 adverse drug events (ADEs) root cause analyses in the fiscal year 2004. med, medication(s). The adverse event caused no harm to the patient in 25.2% (n = 36) of cases, minor injury in 15.4% (n = 22), major injury in 30.8% (n = 44) and death of the patient in 8.4% (n = 12) of cases. The amount of harm to the patient was not reported in 20.3% (n = 29) of the 143 cases. We analysed the relationship between the outcome of the event (on an ordinal scale, where 0 = no harm, 1 = minor injury, 2 = major injury, and 3 = death) and the type of event. Event types related to worse outcomes included: insufficient monitoring of the patient (Spearman ρ 0.262, p<0.001), inpatient taking medications from home (Spearman ρ 0.130, p = 0.003) and adverse drug reactions or allergies (Spearman ρ 0.102, p = 0.021). Event types related to less harm included: medication given to wrong patient (Spearman ρ −0.117, p = 0.008) and failed to give medication (Spearman ρ −0.139, p = 0.002). Figure 3 displays the superordinate root cause categories broken down into more specific subcategories: 18.2% (n = 72) of the root cause were problems with policies and procedures, 19.7% (n = 78) were problems with communication, 12.9% (n = 51) were problems with equipment, 12.1% (n = 48) were problems with medication dispensing, 9.1% (n = 36) were problems with training, 6.5% (n = 43) were problems with staffing, 6.3% (n = 25) were problems with human factors, 5.8% (n = 23) were problems with outpatient medication and 6.4% (n = 25) were problems with other. Appendix A displays the breakdown of action categories into specific action types: 26% of the actions were clinical changes at the bedside, 25% were changes in policy or procedures, 22% were actions involving training for staff, 11% involved adding equipment or software, 6% involved improving communication and 7% of the actions involved collecting data or obtaining more information. Three-quarters (74.9%, n = 492) of these actions were fully implemented and 12.8% (n = 84) were partially implemented. Figure 3 Specific root causes for the 143 adverse drug events root cause analyses in the fiscal year 2004. To analyse the actions, we combined the actions from the aggregated reviews and single case RCAs (N = 993). Actions involving installing or updating new equipment or computers were the most difficult to implement (Spearman ρ −0.071, p = 0.028), and actions improving drug storage were the least difficult to implement (Spearman ρ 0.077, p = 0.016). Not surprisingly, implementation of actions was highly correlated with reports of improved outcomes (Spearman ρ 0.464, p<0.001). Looking at those actions that were fully implemented, addressed the root cause, and were measured for effectiveness (n = 560), we found that all actions involving training and education (n = 133) were negatively correlated with reports that outcome was “much better” (Spearman ρ −0.117, p = 0.005). In addition, we found that all actions involving improvements in equipment or computers (n = 46) and all actions involving improving clinical care at the bedside (n = 127) were associated with reports of improved outcomes (Spearman ρ 0.100, p = 0.018, and Spearman ρ 0.101, p = 0.017, respectively). More specifically, we found that changing the process of medication order entry through the use of alerts or forcing functions was positively correlated with reports of improved outcomes (Spearman ρ 0.097, p = 0.022). Since one of the goals of this project was to share ideas about what patient safety staff in the field reported works to reduce adverse drug events, we developed a list of actions that came directly from the RCAs and were reported to be effective (appendix B). A complete menu of actions that patient safety managers found to be effective for specific types of adverse drug events is available on request. Figure 4 displays further information regarding the actions and their outcome measures broken down by type of RCA: 75.7% of all the actions (N = 993) were reported to be fully implemented, 59.7% of the outcome measures were measures of implementation (“was the action implemented or not”), 23.4% measured the action’s effect on patient outcomes and 12.4% focused on changes in staff behaviours. More actions from aggregated reviews used clinical outcome measures than actions from single case RCAs (χ2 53.53, p<0.001), and more actions from single case reviews used process measures (χ2 11.1, p = 0.001). Figure 4 Characteristics of actions and outcome measures. Figure 5 displays the success factors and obstacles to implementation reported by the patient safety managers or designees. Having help from pharmacy was the top success factor, followed by “persistent follow up”, obtaining feedback from the frontline staff before implementation of the new action and a well-organised tracking system. The leading reported obstacle to implementing the action plans was lack of staffing, followed by lack of middle management support and not enough money to purchase software or hardware upgrades. 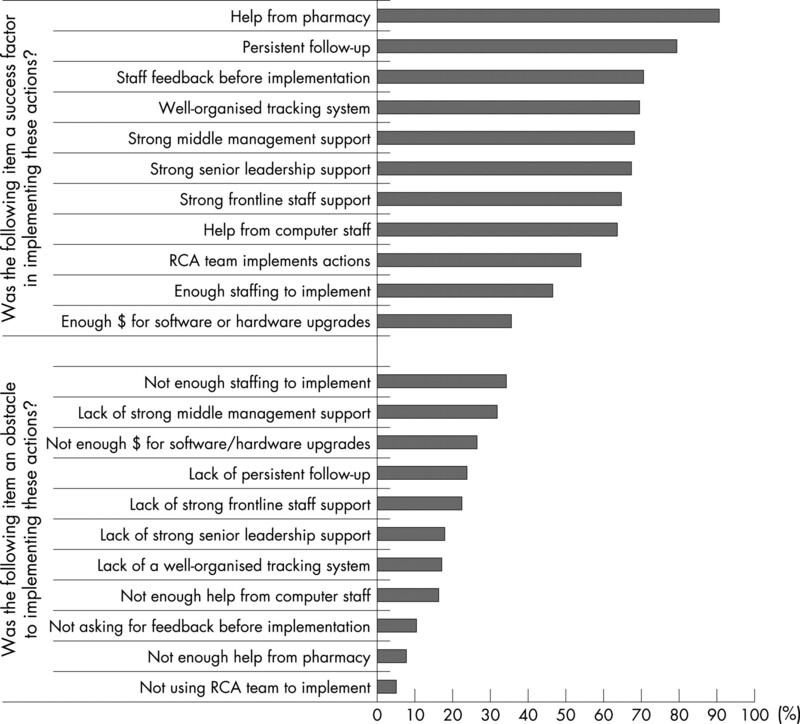 Figure 5 Percentage of patient safety managers reporting success factors/obstacles in implementing actions. Higher rates of improvement (this variable is described in the analysis section above) were correlated with: reports that they had a well-organised tracking system (Spearman ρ 0.229, p = 0.013), strong senior leadership support (Spearman ρ 0.250, p = 0.006), strong front-line staff support (Spearman ρ 0.206, p = 0.027) and reports that they asked staff for feedback before implementing the action (Spearman ρ 0.198, p = 0.033). Higher implementation rates (described above) were correlated with: reports of strong senior leadership support (Spearman ρ 0.310, p = 0.001), strong middle management support (Spearman ρ 0.236, p = 0.011) and reports that they asked staff for feedback before implementing the action (Spearman ρ 0.239, p = 0.010). We examined 254 aggregate and single case RCA reports from 120 VA facilities, and interviewed patient safety managers or their designees about these reports to determine the degree to which actions were implemented, the improvements realised, and the success factors and obstacles to implementation. Among the single case RCA reports only 22% (n = 31) of the single case RCA reports had an actual SAC score of 3, while 39.1% (n = 56) had an actual SAC of 1. The SAC 1 cases caused little or no harm indicating that there were more investigations of “close calls” or “near-misses” than actual adverse events. Among aggregate RCA reports, which reviewed 4834 adverse drug events, we found that problems with policy (specifically, “not following policies”), training and equipment (especially software) were the primary factors contributing to adverse drug events. In contrast, among single case RCA reports, we found that lack of policy, rather than not following existing policy, was the most common root cause of adverse drug events. This focus on policy reflects a general tendency that we have seen in other studies4243 for healthcare administration to rely too heavily on policy and education to solve problems. When a factor that contributes to an adverse event is not specifically dealt with by a policy, there is a strong tendency to create a new policy to address or prohibit the contributing factor. When this is done, it is important to ensure staff are aware of and following the policy, and that changes in staff behaviour are leading to clinical improvements. Other common contributing factors for both aggregated and single case adverse drug events were problems with dispensing and communication. Pooling the actions from the aggregated and single case reviews allowed us to examine relationship between actions and reports of improved outcomes. Similar to findings from our analysis of RCA reports of patient falls in the VA,42 we found that actions involving improvements in equipment or computers and improving clinical care at the bedside were associated with reports of improvement. These findings reinforce the idea that although it is common to rely on policy changes and staff education to address adverse events, focusing interventions on patient care and improving the tools that clinicians routinely use is associated with improved outcomes. Conversely, as found in a previous study,42 actions that focused on training and education were negatively correlated with reports of improved outcomes. These findings are consistent with the principles of problem solving that are based on human factors engineering approaches that show forcing functions and lock-in/lock-out type solutions are much more likely to be successful than interventions that rely solely on training, policy and procedures. Our finding that narcotics, chemotherapy drugs, diabetic medications, cardiovascular medications and anticoagulants (including antiplatelets) accounted for over 63% (n = 91) of adverse drug events is intuitive: these medications are also listed as “high alert” medications by the Institute for Safe Medication Practices44 because of the risk for adverse events. The most common adverse event types were: wrong dose of correct medication given, wrong medication given, failed to give medication, and medication given to wrong patient. The most harmful types of adverse event were: insufficient monitoring of the patient, inpatient taking medications from home and adverse drug reaction or allergies. Accordingly, these medications and event-types should be prioritised as areas of focus for systemic improvements of the medication administration system. Comparing outcome measures for aggregated and single case RCAs, we found that single cases rarely use clinical outcome measures and much more frequently use measures of staff behavioural changes. This may be because aggregated reviews attempt to identify and change trends of adverse events so the actions may be more likely to result in clinical changes, whereas the single case RCAs are more likely to implement protocol/staff changes as a first step toward clinical changes. Our research revealed that facilities that reported improved outcomes had a well-organised system to track the process of change, strong support from senior leadership and frontline staff, and incorporated frontline staff feedback before implementing new changes. Facilities that reported higher implementation rates also reported strong support from upper and middle management and that they asked staff for feedback before implementing actions. These findings are similar to those in our study of RCA reports on parasuicidal behaviours in the VA44; in aggregate, these findings provide more evidence of the relationship between perceived management support and improved clinical outcomes. There are several limitations to this study. First, RCAs, while following a standardised protocol, have not been subjected to reliability analysis across facilities. It is possible that for the same adverse drug event, different patient safety managers would find different root causes and generate different actions and measurements. Second, we relied on self-reports for measures of implementation and effectiveness of the actions, so these results could be influenced by self-report bias. Third, the RCA reports only reflect those adverse drug events that were reported. Additional adverse drug events that were not subjected to the RCA process were likely to have occurred during the time period examined. Fourth, our findings are associative, not causative. Additional study is required to determine, for instance, whether improvement of leadership support would be associated with improved patient outcomes after actions are implemented to address an adverse drug event. Finally, some facilities and geographical regions submitted more RCA reports than others, but we were not able to control for this potential clustering effect due to the relatively small number of reports. Despite these limitations, our study demonstrated that VA facilities actively use both adverse events and close calls to learn about and make changes in patient safety. Also, the VA RCA system effectively captures information from many adverse drug events nationally (nearly 5000 in this analysis), and the system encourages leaders to take actions designed to deal with system vulnerabilities uncovered in the RCA. Although many sites are using creative approaches to measure the effectiveness of these actions to determine if patients are safer when receiving medications, additional effort to standardise such measurement is warranted. As part of a comprehensive programme to achieve understanding of system vulnerabilities while addressing adverse drug events, healthcare systems should consider implementing an RCA system that is designed to collect information on adverse drug events, encourage actions based on strong human factors engineering systems that concentrate on interventions that go beyond the traditional training, policy and procedure approach to prevent future recurrence, and monitor measurable progress toward eliminating adverse drug events. This material is the result of work supported with resources and the use of facilities at the Veterans Affairs National Center for Patient Safety at Ann Arbor, Michigan, and the Veterans Affairs Medical Center at White River Junction, Vermont. This “menu of actions” represents actions that patient safety managers in the VA system have found useful. We are not endorsing these particular actions; rather we are seeking to share actions that patient safety staff in the VA reported to be effective. A much more detailed “menu of actions” including lessons learned is available on request. Separate lidocaine and dopamine intravenous fluid bags. All intravenous medications will have scannable barcode labels affixed to the bag. Two pharmacists will compare the original doctor’s order against the label on high-risk intravenous medications for accuracy before dispensing the drug. Practice will be reflected to changes in the centre’s policy. Eliminate the practice of ordering intravenous chemotherapy medications as narrative text orders. Nursing service will revise their medication policies to include the removal of discontinued intravenous bags and tubing from the patient’s bedside. Pharmacy service needs to develop a chemo policy which clarifies training, competency, validation of orders, verification of final product, documentation and delivery of product with confirmation. Review staffing levels and workload and compare to community standards. If necessary, reconfigure coverage system, including bringing coverage from hospital when required. At the time that narcotics are verified on the ward, the medication will be placed in the medication dispensing cabinet without the Ziploc bag. The Ziploc bag will be returned to the pharmacy where it will be destroyed. Pharmacy will remove all 10 mg/ml hydromorphone from automated mediation management systems and locked narcotic boxes. Develop a systematic process for performing a double check of chemotherapy preparations by a second pharmacist. Medical service, in collaboration with nursing service, will develop a protocol for safe and effective infusion of intravenous iron dextran. limit discharge medication to a 30-day supply. Analyse current staffing allocations in pharmacy and explore staffing alternatives/additions to relieve the solo intravenous pharmacist of numerous distractions, interruptions and vulnerabilities. Addition of blank spacer label between patient labels. Treat oral and intravenous contrast as medication. Oral contrast will be ordered by doctor, dispensed by pharmacy, and administered by a registered nurse or a licensed practical nurse. Consider using automated medication management systems. Implement addendum to current requirement that two nurses who perform double check initial high risk intravenous/epidural bag. Educate 100% of nursing staff on read back policy. Ophthalmology will develop template for admission orders to facilitate the ordering process for those unfamiliar with the computerised medical record (consider implementing with any other specialty clinics that may not have an admission template). inventory locations of central line equipment and develop a check off and replacement system. Establish a system to generate a list of critical drugs available in the electronic medical documentation management system. List to be dated and posted continuously in the intensive care unit, updated quarterly or whenever additions, changes or deletions are made. Updated list to be communicated to a predetermined group within 24 hours of changes being made. Patients will no longer be dropped from the genitourinary cancer (Zoladex, goserelin acetate) clinic unless ordered by a doctor. Implement the use of existing computerised narcotic software wherein licensed nursing staff can do the following: order controlled substances; receive controlled substances; mark completed green sheet ready for pick up; view pending orders which will prevent duplicate orders. Provide education to all licensed staff using the software. Address minimal or preferably no distractions during admixture of cardioplegic solution in at least three staff meetings. All nurses will annually review the allergy warning process in computerised patient record system (CPRS) as part of their competencies. A cognitive aide will be developed and updated yearly for the intensive care unit healthcare team specific to ownership and responsibility for timely communication, documentation and interventions in the care of the acutely ill patient. Add dosing criteria/guidelines for enoxaparin to CPRS (blue line/hyperlink). patient having a primary care provider, no narcotic usage contract and a self-limiting injury would be prescribed less than a 14-day supply. Update nursing admission template to include question worded, “Did you bring medications with you to the hospital?”. If yes, nursing should secure medications per policy (either label and send to pharmacy or send home with a family member). Pharmacy staff will use read back method when receiving communication about medication (ie, route, dose, etc.). Educate patients at new patient orientation to the concept of tablet splitting and importance of reading label on medication bottle. Medical director and computer staff will review allergy alerts for updates/changes and share the changes with medical providers. Develop and implement an action plan for the patient-controlled analgesia programme to default to “0 mg/0 ml” when the pump is programmed for new patient data. Pharmacy will manually add barcode labels to all vials of insulin stocked in the inpatient care units. Develop a method to either physically separate or change labelling for medication with similar sounding names. Reorganise the storage compartments for code medication in the anaesthesia supply cart based on risk and needs assessments. Example: Separate advanced cardiac life support (ACLS) medications from 2% lidocaine. By standardising infusion volumes and weighing admixed bags to assure accuracy, pharmacy will standardise an exact infusion rate for all continuously infused chemotherapeutic agents and indicate the rate on the infusion bag. Develop and implement a training programme to train designated pharmacists and technicians assigned to cardioplegic compounding. Make forms visible and easily accessible on medication administration carts and at the nurse’s station where the verification process is taking place.
. The nature of adverse events in hospitalized patients. Results of the Harvard Medical Practice Study II. N Engl J Med 1991;324:377–84.
. Adverse drug events in hospitalized patients. Excess length of stay, extra costs, and attributable mortality. JAMA 1997;277:301–6.
. 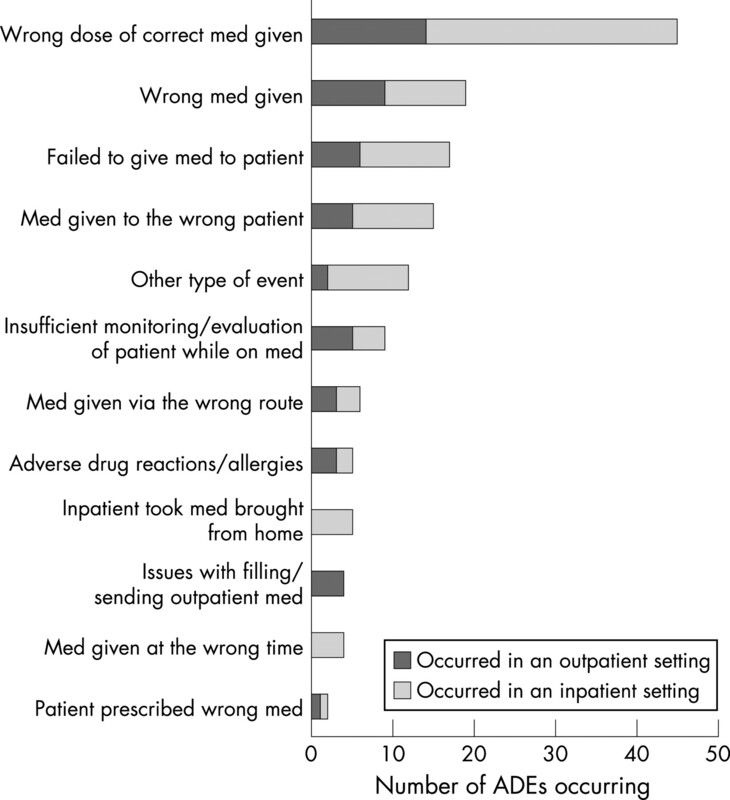 Medication prescribing errors in a teaching hospital. JAMA 1990;263:2329–34.
. The organizational costs of preventable medical errors Jt Comm J Qual Improv 2001;27:533–9.
. The costs of adverse drug events in hospitalized patients. JAMA 1997;277:307–11.
. Systems analysis of adverse drug events. JAMA 1995;274:35–43.
. Causes of medication errors. In: Cohen MR, ed. Medication Errors. Washington, DC: American Pharmaceutical Association, 1999:1.1–1.8. Institute of Medicine. Nursing: inseparably linked to patient safety. In: Page A, ed. Keeping patients safe: transforming the work environment of nurses. Washington, DC: The National Academies Press, 2004:23–52.
. Managing the risks of organizational accidents. Brookfield, VT: Ashgate Publishing Company, 1997.
. Application of human factors engineering in process and equipment design. In: Manasse HR, Thompson KK, eds. Medication safety: a guide for health care facilities. Bethesda, MD: Am Soc Health-System Pharm, 2005:201–26.
. Identifying adverse drug events: development of a computer-based monitor and comparison with chart review and stimulated voluntary report. J Am Med Informatics Assoc 1998;5:305–14.
. Identifying drug safety issues: from research to practice. Int J Qual Health Care 2000;12:69–76.
. Detecting adverse events for patient safety research: a review of current methodologies. J Biomed Inform 2003;36:131–43.
. Use of morning report to enhance adverse event detection. J Gen Intern Med 1996;11:454–60.
. Physician reporting compared with medical-record review to identify adverse medical events. Ann Intern Med 1993;119:370–6.
. Drug complications in outpatients. J Gen Intern Med 2000;15:149–54.
. The incidence and severity of adverse events affecting patients after discharge from the hospital. Ann Intern Med 2003;138:161–7.
. Room for improvement: patients reports on the quality of their health care. The Commonwealth Fund; 2002.
. Comparison of methods for detecting medication errors in 36 hospitals and skilled-nursing facilities. Am J Health-System Pharm 2002;59:436–46.
. The reliability of medical record review for estimating adverse event rates. Ann Intern Med 2002;136:812–6.
. Detecting adverse events using information technology. J Am Med Inform Assoc 2003;10:115–28.
. Development of a computerized adverse drug event (ADE) monitor in the outpatient setting. In: Henriksen K, Battles JB, Marks ES, et al., eds. Advances in patient safety: from research to implementation, Volume 2. Rockville, MD: Agency for Healthcare Research and Quality, 2005:CD.
. A computerized method for identifying incidents associated with adverse drug events in outpatients. Int J Med Informatics 2001;61:21–32.
. Capability of hospital computer systems in performing drug-use evaluations and adverse drug event monitoring. Am J Hosp Pharm 1993;50:1889–95.
. Computerized surveillance of adverse drug reactions in hospital: implementation. Eur J Clin Pharm 1999;54:887–92.
. Incidence and costs of adverse drug reactions during hospitalisation. Drug Saf 2000;22:161–8.
. Detection and incidence of drug-induced liver injuries in hospital: a prospective analysis from laboratory signals. Br J Clin Pharm 2000;50:479–84.
. Identification of patient-controlled analgesia overdoses in hospitalized patients: a computerized method of monitoring adverse events. Ann Pharm 1994;28:655–8.
. Description of a computerized adverse drug event monitor using a hospital information system. Hosp Pharm 1992;27:774–83.
. Computerized surveillance of adverse drug events in hospital patients. JAMA 1991;266:2847–51.
. RADARx: recognizing, assessing, and documenting adverse Rx events. AMIA Annu Symp Proc 2000 :101–5.
. Use of a clinical event monitor to prevent and detect medication errors. AMIA Annu Symp Proc 2000 :640–4.
. A computer alert system to prevent injury from adverse drug events: development and evaluation in a community teaching hospital JAMA 1998;280:1317–20.
. Using computerized data to identify adverse drug events in outpatients. J Am Med Informatics Assoc 2001;8:254–66.
. Root cause analysis. In: Shojania KG, Duncan BW, McDonald KM, et al., eds. Making health care safer: a critical analysis of patient safety practices. Rockville, MD: Agency for Healthcare Research and Quality, 2001:51–6. Joint Commission on Accreditation of Healthcare Organizations. Sentinel Event Policy and Procedures, 2005. Available at: http://www.jointcommission.org/SentinelEvents/PolicyandProcedures/ (accessed 17 April 2006).
. Developing and deploying a patient safety program in a large health care delivery system: you can’t fix what you don’t know about. Jt Comm J Qual Improv 2001;27:522–32.
. Using aggregate root cause analysis to improve patient safety. Jt Comm J Qual Improv 2003;29:434–9.
. Developing a culture of safety in the Veterans Health Administration. Eff Clin Pract 2000;3:270–76. VA National Center for Patient Safety. Glossary of patient safety terms, 2006. Available at: http://www.patientsafety.gov/glossary.html (accessed 19 April 2006).
. Using aggregate root cause analysis to reduce falls and related injuries. Jt Comm J Qual Improv 2005;31:21–31.
. Actions and implementation strategies to reduce suicidal events in the VHA. Jt Comm J Qual Safety 2006;32:130–41. Institute for Safe Medication Practices. High alert medication list. Available at: http://www.ismp.org/Tools/highalertmedications.pdf (accessed 14 July 2006). The Institutional Review Board (IRB), Dartmouth College, approved this project (CPHS # 17303). Competing interests: The authors have no conflicts of interest other than that we are reporting outcome from the organisation for which we are also employed.